Lately, I've had some projects going on at work, and I've had to be there longer hours than normal. Having makeup in my desk to freshen up has been a must. Almost as important as my morning cup of coffee. Almost. 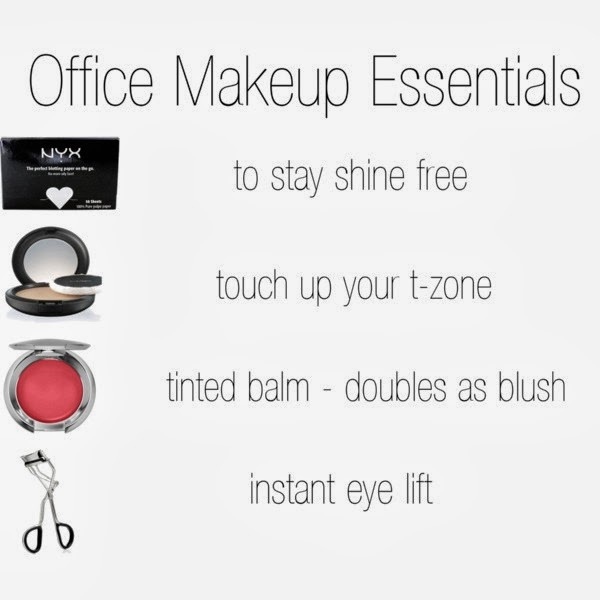 I wanted to share my office makeup essentials with you. 1. Blotting papers will get rid of excess oil without removing your foundation. Starbucks napkins also work great! 2. A powder freshen will keep you shine free and flawless, but don't do it if you've skipped #1, you'll look a little cakey. 3. Lip balm is great on your pucker, but it also doubles as blush in a pinch. I apply to my lips first, then dab the excess on the apples of my cheeks. 4. Hit your eyelashes with a quick curl midday to give yourself an instant eye lift. This works better than using another coat of mascara, which can cause clump. What products do you keep in your desk to keep you looking fabulous throughout the day? Blotting papers are my God send. I work in an Atrium, all glass enclosed front desk. I get really oily!